Creating, planning, organizing and leading a group tour is challenging. Save time, save money, see truly special places and enjoy yourself by enlisting the help and talents of local experts. Your tour will be customized for your group’s size, travel style, interests and the season that fits your schedule. Spring is a special time filled with bulbs, flowering trees and bushes. Summer brings long days of horticultural delights and glorious gardens. Fall is when the Japanese maples are at their best, vineyards and farms are harvesting the earth’s bounty. The region is also home of numerous flower festivals, horticultural conferences, world-class lecturers, private open garden days and harvest activities. 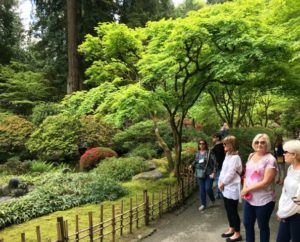 Because Gardens•Tours is local, we can build your group’s tour around one of these special events for a truly unique experience. Gardens•Tours can also offer options for non-gardening partners. Portland, Seattle and Victoria are all near places of natural beauty so non-gardeners could enjoy sights such as The Columbia River Gorge, whale watching, Olympic National Park, brewery/winery/distillery/cider house tours, guided hikes and more. Since each tour is customized for your group, you decide what is included in your tour.